OK I did cook this last Friday, a whole bunch of them actually for some a lovely pregnant friend and my sister-in-law. The fact I made a whole heap of them shows it is so easy to make! 1. Fry the chopped onion and crushed garlic in a little oil for 5 minutes. 2. Add the minced beef, mushrooms and herbs. pinch of nutmeg. Stir mixture constantly until thick. meat mixture and cheese sauce, finishing with the cheese sauce. 6. Sprinkle with grated parmesan cheese and bake at 200°C for 35 minutes. I add 1 grated carrot and any other vegie in the fridge thats can be grated. Not very 'Ellable' but you could use tortilla sheets or something else and make it a mexican lasagne and use avocado in between the meat. Now I might even try that one. It is the best meal to make in small oven proof containers and freeze for those days you don't want to cook. 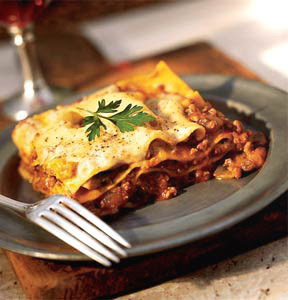 I had to find a picture on the net to make your mouth water a little, but I will do my best to get a photo of my very own lasagne, not sure it will look as good as mandy's.